Laurence Astill is a London-based Saxophonist who is currently studying at the Royal College of Music. Having completed his undergraduate degree in Music at the University of Southampton, obtaining a First in performance, he began studying for his Master of Performance under the tutelage of Kyle Horch in September 2016. 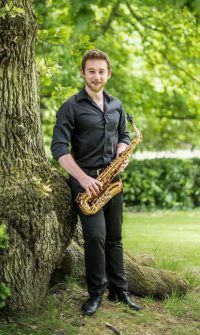 He has received a number of awards and grants including the Jane Melber Saxophone prize, the Vicky Cox Award, an EMI Music Sound Foundation bursary and The Elmley Foundation award. During his time at Southampton, he was chosen to perform in the ‘Southampton Showcase’ programme – a concert series displaying Southampton’s most talented musicians. As a member of the Momentum saxophone quartet, they were chosen to premiere Martin Humphries’ new work for saxophone quartet and chorus, Moz Pit. They have also been selected to perform at the World Saxophone Congress in Zagreb this July where they will be performing Guillermo Lago’s challenging work, Cuidades.